Inca reporters are executable programs and scripts, generally small, that test and report the health and characteristics of a system. 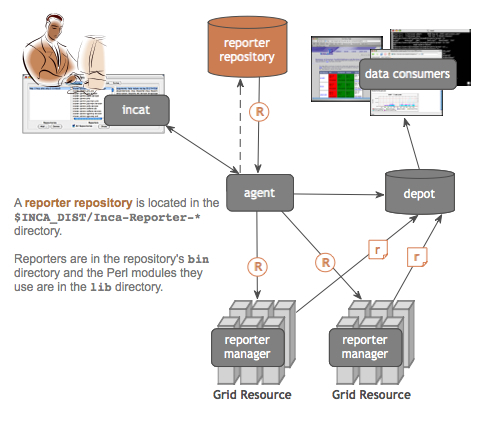 The figure below illustrates a typical Inca installation where reporters are retrieved from a repository and sent to Reporter Managers on Grid resources by the Agent. The Reporter Managers then execute the reporters based on series configuration from the Agent and send the XML reports to the Depot for storage. You should now see XML output like that in Section 7.2.2. All Inca reporters must support the command line arguments listed in the table below. In addition, a reporter may support additional command line arguments specific to that reporter's task. Do not run the reporter; instead, print information on running it. If the value of the verbose argument is 0, this information will be readable text; otherwise, it will be reporter XML. Include reporter log messages in the reporter output. The named argument values indicate specific types of log messages that should be included. 0 indicates no log messages should be included; the other numeric values indicate error, warn, system, info, and debug messages, cumulatively. For example, --log=2 indicates both error and warn messages should be included, while --log=4 includes error, warn, system, and info messages. Determine what the reporter prints. A verbose level of 0 indicates that the reporter prints only 'completed' or 'failed', depending on the outcome of its testing. Verbose level 1 produces XML that reports the testing result, and verbose level 2 adds additional tags to this XML to give instructions on running the reporter. Do not run the reporter; instead, print its version number. Reporters can be written in any language as long as they output XML according to the schema described in Section 7.2.1. New reporter developers may choose to write reporters in Perl or Python since the Inca distribution includes sample reporters and API modules in those languages (Section 7.2.3) for printing XML according to our schema. NOTE: Because some databases won't allow queries greater than 4kB, the XML portion of the report for logging/debugging and the error message must each be smaller than 4kB in size. The body XML can be 12kB in size because it is queried in three parts. If the report XML is greater than its limit, the depot truncates the oversized section from the beginning until it is the right size. In order to promote interoperability between reporters, we define a specification for how reporter output should be formatted. Given the wide acceptance and availability of tools for XML, the specification requires that reporter output should be formatted using XML. Furthermore, we specify a basic schema that the XML should follow so that we can handle the output in a general manner. The goal of this schema is to be flexible enough to express a wide variety of data. Our approach is to require a number of XML fields which provide metadata about the output and define one of the fields, body, to be abstract. The body field is a placeholder for the formatted output and can be replaced by any XML substitution group thereby allowing this schema to accommodate a large variety of output. In other words, the basic schema is like an abstract class and the substitution groups provide for subclassing. The reporter schema is visualized in Figure 18. Here is the output from the successful run of a typical Inca reporter. The content and meaning of the XML tags is described below. As shown in Figure 19, reporter output begins with an XML preamble and is surrounded by <report> tags. A prefix with a tag name that references http://inca.sdsc.edu/dataModel/report_2.1, which is the namespace that defines the report schema, can also be used. The body tag contains the results of the reporter testing. The only requirement for the contents of this tag is that they must be well-formed XML--tags balanced and no extraneous <, >, and & characters. Figure 19 shows the conventional body for version reporters. Includes the boolean <completed> tag, indicating whether or not the reporter successfully completed its testing, and the optional <errorMessage> tag, which contains a string indicating why the reporter failed to complete. OPTIONAL TAG (not shown in Figure 19 report). The help tag describes the reporter and how to run it. Contents include the reporter name, version, description, and url, detailed descriptions of each argument, and an optional list of dependencies that the reporter has on other packages. For example, here is the <help> section for the gcc version reporter. This module is the general reporter API and is the base class for all types of reporters. It automates determination of hostname, gmt, reporter name,sx etc., handles command-line parsing, provides an interface for log messages, and handles XML generation. This module is used for Globus unit tests. it provides methods for running Globus jobs. The Inca::Reporter::GridProxy package is a pseudo-module indicating that a reporter requires a proxy credential in order to execute. The following is an example of a perl reporter that requires a proxy. Python reporters should use the equivalent, reporter.addDependency('inca.GridProxyReporter'). This module is used to gather system performance metrics. It defines a common <body> schema for system/software performance metric reporters and produces a collection of benchmarks, each a set of parameters (name/value) and statistics (name/value/units). A dependent Benchmark class is used to define individual benchmarks. This module is used for software unit tests. It defines a common <body> schema for unit test reporters and provides methods for recording results of unit tests. This module is used for creating simple usage reports. This module is used for reporting software versions. It defines a common <body> schema for version reporters, offers support for subpackage versions, and provides convenience methods for common ways of determining version. The following is the Perl code for a reporter that produces output like Figure 19. This reporter uses the Inca::Reporter::Version module to determine the version of gcc. Examples of reporters that use the other modules are located in $INCA_DIST/Inca-Reporter-*/bin. For reporters that create temporary files or directories, the APIs offer a function called "tempFile" to remove them. If the tempFile function is used then additional code to remove temporary files or directories (e.g. unlink or rm) is not required. The reporter below uses the tempFile function to remove the temp $scratchDir it creates. It's best practice never to use a PID or variable information as a reporter argument value or to include PIDs or timestamps in error messages. Reporters that incorporate this sort of information will create a new report in the Inca database each time the reporter runs, which may slow query response. If a reporter error message may contain variable information, a function to replace the variable can be written to normalize the error (like the "failClean" function in the reporter below). The Inca system retrieves reporters from external collections called repositories. A reporter repository is simply a file directory, accessed via a file: or http: URL, that contains a catalog file named Packages.gz. This gzipped file includes a sequence of name:value attribute pairs for every reporter and support package in the repository; blank lines separate the attributes for different reporters. For example, here is a portion of the Packages.gz file for the Inca standard reporter repository. Of the attributes shown, only file and name are required. The file attribute gives the relative path to the reporter file, and the name attribute specifies the unique package name of the reporter. If the reporter requires support packages to execute, it should include a dependencies attribute with a semicolon-separated list of package names. For more information about reporter package dependencies see Section 7.3.1. The incat administration tool uses the Packages.gz file's arguments and description attributes as part of its series edit dialog. The value of the arguments attribute is a semicolon-separated list giving the name, value pattern, and default value, if any, for each supported command-line argument. To create a local repository for your own reporters, you only need to collect them into a directory and create a Packages.gz in that directory. The default Inca installation has a Packages.gz file in $INCA_DIST/Inca-Reporter-* that can be added in incat. Inca also supplies a web accessible repository that can be added in incat as "http://inca.sdsc.edu/repository/latest/". incpack runs each of the listed reporters with --help=yes --verbose=1 to extract a standard set of attributes. If your reporters use the Inca reporter APIs, you might need to run incpack with -I switches to specify the location of the Inca libraries, like this. For more information about incpack usage, click here. Some reporters may require a CPAN Perl module, C library, compiled executable, or some other tar.gz packaged dependency. Reporters can use packaged dependencies if the dependencies are 1) bundled into a tar.gz file, 2) added using incpack to the reporter repository, and 3) noted as a dependency in the reporters. If configure, [M|m]akefile, Makefile.PL and Build.PL files aren't found, then the package dependency .tar.gz file is just unzipped and untarred in the build directory. Connect to the agent in incat, select the Repositories tab, then press the Refresh button under the repository panel. If the revised reporter still isn't deployed, look for any errors in the $INCA_DIST/var/agent.log that indicate the agent was unable to fetch the reporter or skipped over updating it. Make sure there is an active series that uses the reporter with "use latest version" checked on the resource your intend it to run on incat. Look for $INCA_DIST/var/repository/repository.xml entries for the reporter with "<latestVersion>false</latestVersion>" (should be "<latestVersion>true</latestVersion>" to get the updated reporters).